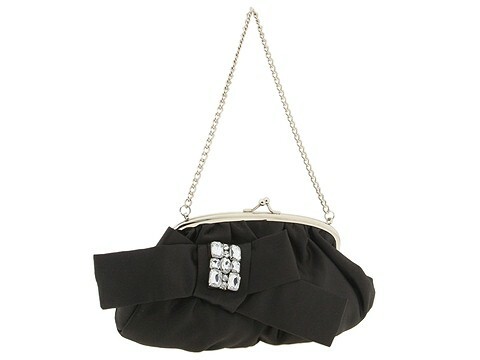 Jessica McClintock's 'Bow Stone' clutch is the perfect party accessory. Clutch style handbag made of satin. Holds your credit cards, currency, lipstick and a slim cell phone. Dimensions: 10 1/2 wide x 2 deep x 5 1/2 high. ; Single chain handle. Handle drop: 6 in length. Stone accents. Bow detail. Ball clasp lock closure. Interior lining with a back wall slip pocket.